Golf Course Managers and their teams of green keepers undoubtedly have a tough job. Have you ever thought how hard it is to keep you own garden in reasonable shape ? Yes – then try thinking about a site the size of a golf course. Course Managers have a thankless task at the best of times with the unpredictable weather often impacting on their maintenance programmes and the final course presentation that you and I see when we turn up for our game. Of course, such matters are not helped at this time of year by The Masters. Every golfer switches on their TV in April to see an immaculate Augusta National course with pristine fairways, beautiful flowers and fast, perfect greens. They then turn up at their own course and start to make comparisons which are totally unfair – based on climate, play and budgets to name but three differentiating factors. Course Managers soon know the golfing season has started as the criticism starts ringing in their ears from unqualified and often blinkered members. I think we all need to stop criticising and start asking ourselves whether we are doing enough to help the greens staff at our courses. Indeed some of us may be actually contributing to some of the problems they are facing ? I was trawling through my golf photos on Pinterest earlier and put these together to make a photo I could post on Twitter. The Three R’s – Replace, Repair and Rake and While You’re At It – Get A Move On. I often see evidence at my club of poor course etiquette by members when playing my rounds. Club members need to start sharing the responsibility with their greens staff for the state of their courses. I don’t expect people to turn up with their mowers but just ask that everyone is a little more conscientious. It’s not difficult but many golfers are simply not respecting their fellow players and the courses they play on. 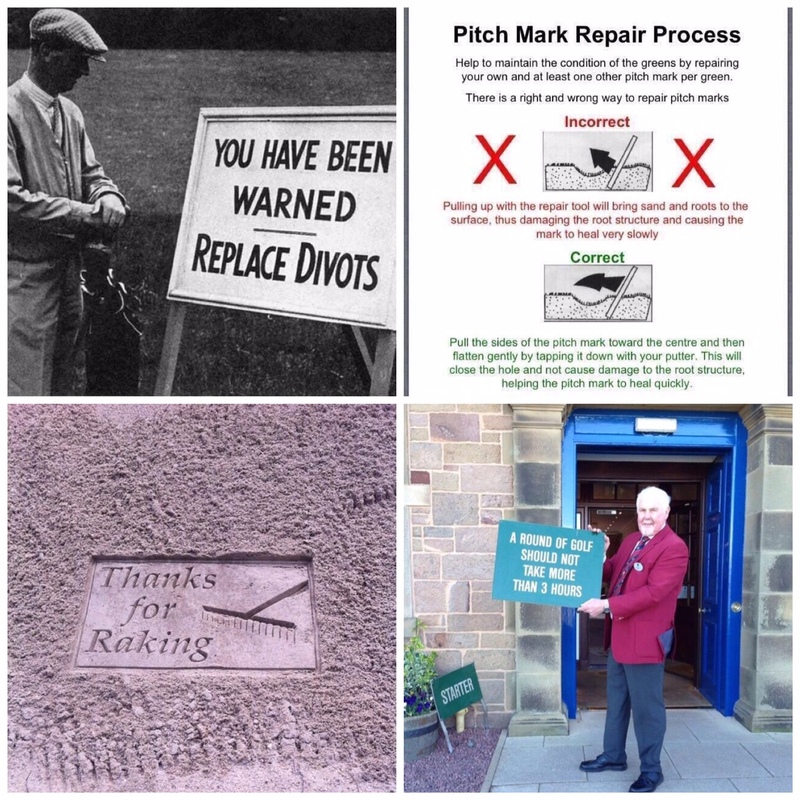 I am really going to make an effort this season to replace any fairway divots, properly repair any pitch marks on greens and rake all untidy bunkers that I come across – irrespective of whether I am responsible for them. It may be a back to basics approach but I am sure if we all adopt the three R’s when we play we can make a really positive impact at our Clubs. This entry was posted in Golf Miscellaneous and tagged Etiquette. Bookmark the permalink.